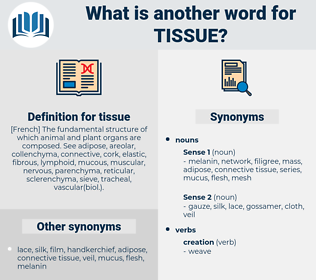 What is another word for tissue? [ French] The fundamental structure of which animal and plant organs are composed. 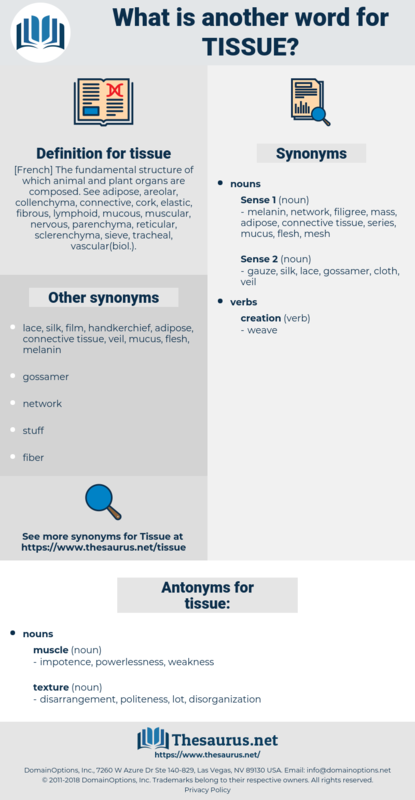 See adipose, areolar, collenchyma, connective, cork, elastic, fibrous, lymphoid, mucous, muscular, nervous, parenchyma, reticular, sclerenchyma, sieve, tracheal, vascular( biol.). handkerchief, fabric, flesh, cell, kleenex. There was a great orange - yellow diamond in various folds of tissue - paper, and a thick wad of bank - notes, with an indiarubber band round them. If I lay sheets of tissue paper over it and pin them carefully, do you think you can carry it? plait, loom, twill, lace, net, braid, web, brocade.